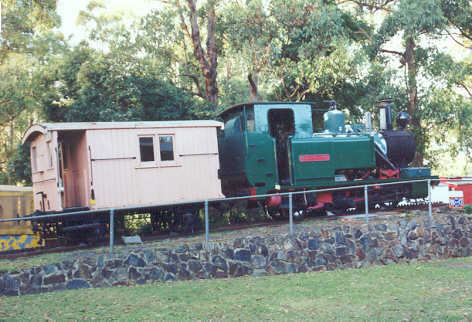 Abt N.5 displayed with an Abt brake van on an inclined section of rack railway at the Puffing Billy Museum, Menzies Creek. This scanned photo view dates from 1996. This locomotive was built by the North British Locomotive Co Ltd in 1938 (builder's number 24418) (a) as a very late repeat order of the earlier four locomotives built by Dubs & Co in the 1890's. (North British Locomotive Co was created by the amalgamation of a number of Glasgow builders, including Dubs & Co.) It was provided with the nameplate "Mount Lyell No.5" but was more commonly known as Abt No.5. Abt No.5 and its four sister locomotives settled in to a life of hauling copper concentrates, mine supplies and general traffic over the My Lyell rack railway, supported by conventional locomotives on the non-rack sections of the route. The five Abt locos were originally coal burners but were converted to oil firing late in their working lives. Following the rebuilding of the old Mount Lyell railway for tourism, Abt No.5 have since been acquired by the West Coast Wilderness Railway and was placed on a low loader for the start of its journey back to Tasmania on 19 November 2003. It was overhauled under contract by Saunders & Ward, Hobart (who had also overhauled Abt No.1 & Abt No.3) and entered service on the West Coast Wilderness Railway in June 2006. The Abt brake van has also returned to Tasmania and been restored to operation on the West Coast Wilderness Railway.